ABU DHABI, 20th November, 2018 (WAM) -- H.H. Sheikha Fatima bint Mubarak, Chairwoman of the General Women's Union, President of the Supreme Council for Motherhood and Childhood, and Supreme Chairwoman of the Family Development Foundation, this evening attended the awards ceremony marking the announcement of the winners of Sheikha Fatima bint Mubarak Award for Motherhood and Childhood. A number of charities, government entities and individuals were honoured for supporting and protecting mothers and children during the ceremony which was held at the Emirates Palace in the presence of Dr. Amal Abdullah Al Qubaisi, Speaker of Federal National Council; H.H. Sheikh Hazza bin Zayed Al Nahyan, Deputy Chairman of Abu Dhabi Executive Council; H.H. Lt. General Sheikh Saif bin Zayed Al Nahyan, Deputy Prime Minister and Minister of the Interior; H.H. Sheikh Mansour bin Zayed Al Nahyan, Deputy Prime Minister and Minister of Presidential Affairs; Sheikh Nahyan bin Mubarak Al Nahyan, Minister of Tolerance; along with a number of Sheikhas, Saudi princesses, ministers, dignitaries, and state officials. "The UAE, since the time of late Sheikh Zayed, has been keen to invest in and build human capital since they are the nation's most cherished and valuable asset. An approach which has, since then, been closely followed by President His Highness Sheikh Khalifa bin Zayed Al Nahyan, His Highness Sheikh Mohammed bin Rashid Al Maktoum, Vice President, Prime Minister and Ruler of Dubai, and His Highness Sheikh Mohamed bin Zayed Al Nahyan, Crown Prince of Abu Dhabi and Deputy Supreme Commander of the UAE Armed Forces, along with Their Highnesses Rulers of Emirates" Sheikha Fatima said in a statement read on her behalf by H.H. Sheikh Saif bin Zayed. "The nation is taking primary care of people of various social backgrounds, the priority of whom are mothers and children. It's essential for children to be raised in an emotionally and intellectually safe environment because they are the future makers and will become entrusted once grown to become confident, willing and relentless people." The primary role of a mother is childcare and contribution to the development of the country through her involvement in public roles, she added. "An ideal mother is one who can balance work and family, raising her children well to prepare and engage them in the making of the nation’s future and development." The award, launched in 2016, opens the doors of excellence and innovation, both locally and internationally, aiming to prioritise mothers and children and find the means of providing them with the best care. Awards for the best initiatives and scientific research to support children and women were announced during the ceremony. 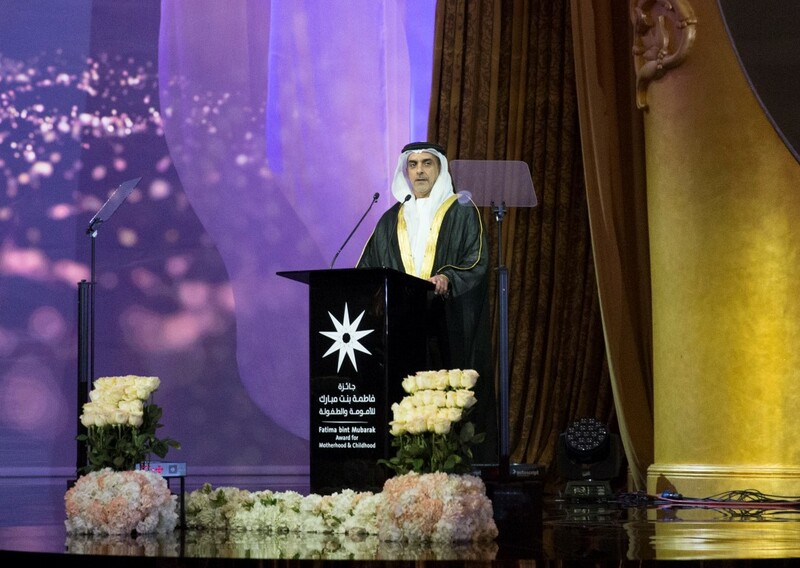 Among the honourees was Princess Sara Al Faisal bint Abdel Aziz Al Saud, Chairwoman of Saudi Arabia's Al-Nahda Philanthropic Society for Women whose prize was received on her behalf by Princess Haifaa Al Faisal bint Abdel Aziz Al Saud. H.H. 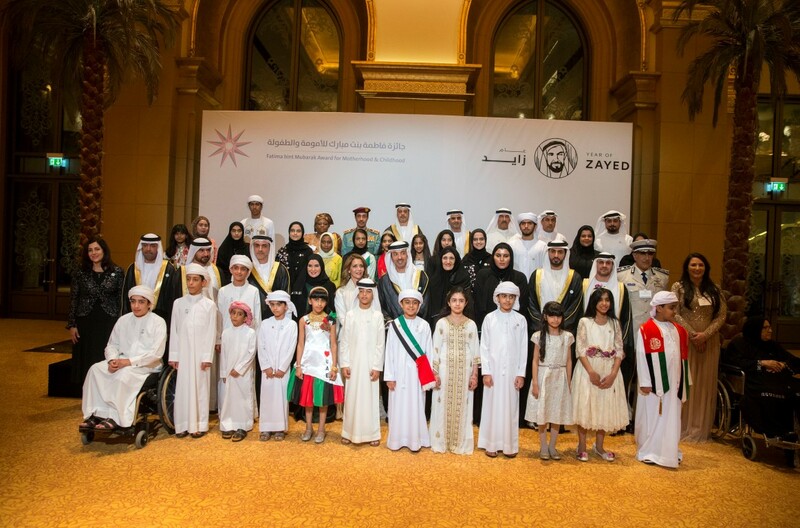 Sheikh Hazza bin Zayed Al Nahyan, Deputy Chairman of Abu Dhabi Executive Council, and Reem Al Falasi, Secretary General of the Supreme Council for Motherhood and Childhood, honoured the key personalities that play eminent roles in supporting mothers and children, atop of whom is H.H. Dr. Sheikh Sultan bin Mohammed Al Qasimi, Supreme Council Member and Ruler of Sharjah, whose prize was received by H.H. Sheikh Abdullah bin Salem bin Sultan Al Qasimi, Deputy Ruler of Sharjah. H.H. Lt. General Sheikh Saif bin Zayed Al Nahyan, Deputy Prime Minister and Minister of the Interior, was honoured as well and received his prize from H.H. Sheikh Hazza in recognition of his significant role at the local and international levels in protecting children. Abu Dhabi Media Company was honoured as the best media entity supporting childhood programmes and Director-General Dr Ali bin Tamim received the award. Ahmed Mohammed Al Humairi, Secretary-General of the Ministry of Presidential Affairs, received the 'best nursery award' which was won by the UAE Presidential Court. The Best Initiative in the Development of Children’s and Youth’s Talents Award was won by Al Jalila Cultural Centre for Children and received by HRH Princess Haya bint Al Hussein, wife of the His Highness Sheikh Mohammed bin Rashid Al Maktoum, Vice President, Prime Minister and Ruler of Dubai. Awards on the following categories were presented to their winners: -Best Scientific Research in the Field of Motherhood and Childhood -Leading Mother and Child Friendly Entity -Best Campaign/Outreach Program in the field of Motherhood & Childhood -Best Initiative in Early Education -Best Initiative in Empowering children with disabilities -Best Initiative in the field of Child Protection -Best Initiative in the Support of Mother and Child’s Healthy Lifestyle -Best Community Contribution in the field of Motherhood & Childhood -Emirates First Child In her word marking the occasion, Al Falasi expressed sincere gratitude to the colossal efforts made by H.H. Sheikha Fatima in providing mothers and children with utmost care and protection. "The UAE has become a role model for caring about mothers and children. The country participates in various international forums to introduce thoughtful indicatives focused on motherhood and chidlren," she added.